With all substrates fineoptically polished. These filters by far supersede the mediocre quality of common `flame polished` color filters. 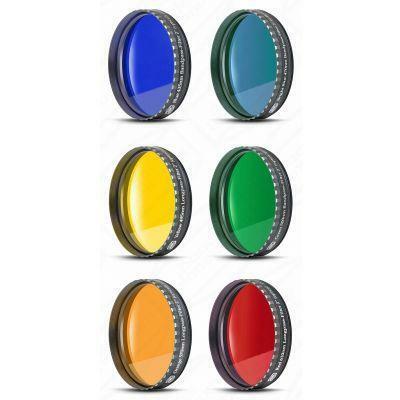 Fineoptical polish and 2 mm thickness allows these filters to be inserted anywhere into the optical path without introducing astigmatism or other defects. For instance they can be used in front of a binocular viewer without degrading the image in any way. Substrates are free of striae and planeparallel polished to within 30 seconds of arc. This eliminates any double images or ghosting due to wedge errors in the glass. PCG multi-coating. The set comprises three longpass and three genuine bandpass filters, which act similar to a nebula filter, so that only a small portion of the visual spectrum is transmitted to emphasize certain planetary surface detail. Transmission efficiencies for the three longpass- filters (Yellow, orange and red) peaks at 98 %, while the efficiency for the three bandpass-filters peaks at almost 70 percent – unheard of for a simple colored glass-filter! All filters have standard 31.7mm eyepiece filter threads, tested and optimized to fit allmost all eyepieces on the market. Each filtercell has a male as well as a female thread to allow stacking for narrower passbands or to combine with our UV/IR Cut-filter. The combination of the red RG 610 (# 2458307) and IR-Cut-filter (# 2459207) for instance results in an extremely narrow H-alpha passband-filter – at an incredibly cheap price. The filter cell features the largest clear aperture of any 31.7mm filter on the market – for complete freedom from vignetting at any focal length. The front `crown` incorporates milled notches, which makes handling and threading the filter an easy operation in the dark. All surfaces are treated with a 7-layer Multi-Coating, featuring a mere 0.25 % residual reflection. It is the most sophisticated coating ever applied onto amateur color filters, resulting in a filter free of any false reflections under any incident angle of light. As mentioned onwww.cloudynights.com: LIGHT (transmission) is the hottest commodity for all planetary observation. Especially during high magnification work `enough light` is the deciding factor for the recognition of subtlest planetary surface detail, much more important than a horde of different filters of mediocre execution. planets that we use filters to see. Painstaking attention to coatings and perfect optical figuring are simple reasons why the image contrast through these premium filters is almost perfect.